Shrimp is one of my favorite things to eat, especially when it is Lent. Every Friday during Lent, Lucas and I have the same struggling question, “What’s for dinner?” I hate, hate, hate that question because it always falls on days that I have meat in the refrigerator or I’m craving a juicy burger. Hahaha. These are though totally satisfying and so easy to make! In a bowl, drizzle 2 tablespoons olive oil over shrimp and add salt and pepper. Cook shrimp for about 2 minutes on each side, until shrimp turn from grey to pink. 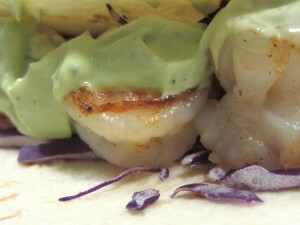 While shrimp is cooking, add sour cream, avocado, juice from lime, cilantro, salt and pepper to food processor. Blend until you reach desired creamy consistency. 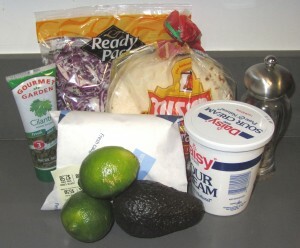 Construct tacos with warm tortilla, cheese, shrimp, cabbage and avocado sauce! Yum!